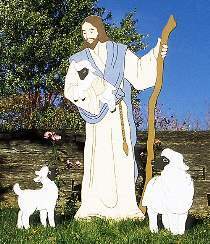 These yard ornaments portray Jesus the shepherd who tenderly cares for his flock. Easy to cut from 1/2" plywood. All projects have been specially designed to be easy to paint. All plans drawn FULL SIZE. 47"H. Order #8565 Mounting Kits separately.